Christopher Downing lives in Massachusetts and will graduate from high school in June. 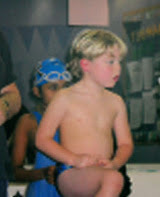 He has spent the past 12 years of his life swimming at a very competitive level. He has swum thousands of miles during endless practices and meets spanning 14 states! 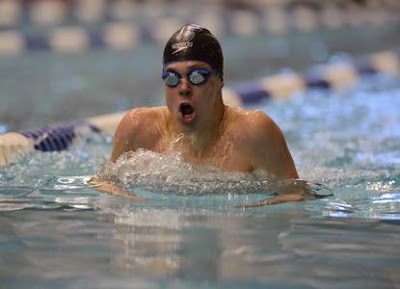 Christopher joined his 1st swim team at age 5 and has been swimming competitively ever since. When he was 5 they would 'write his name in' on the swim meet heat sheets, because you had to be 6 to join a swim team and compete. Most teams wouldn’t let him join as he was too young. One coach at a local YMCA thought for sure, once Christopher tried out for the team, he would see for himself why he needed to wait until he was a bit older to join a team. USA Junior National meets in Indianapolis and at the University of Tennessee and Speedo Grand Prix in Missouri. In December 2012, he qualified for his team’s first ever National Team cut and was on his way to Junior Nationals in Irving, California in August 2013! He was selected as an Athlete Represented during junior and senior years to serve on the NE Swim board. The highlight has been: He was one of the 3 athletes representing NE at the USA convention in Sept 2013 in Irving, California. His selection into the USA Swimming Scholastic All American team member for the past 2 years (minimum GPA of 3.5) Christopher hopes to be an example to the younger team members that they can swim their personal best in the pool and also do their personal best in school. 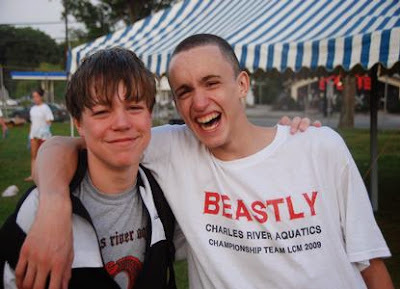 He has swum thousands of miles at endless practices and meets for twelve years! One of his earliest goals was to swim Division 1 in college on scholarship. He can now check that off his bucket list as he was fortunate to be invited by 5 colleges on recruiting trips and ultimately selected Boston University because it was close to home. He signed his National Letter of Intent with BU on November 15th and will be part of their 2018 class! 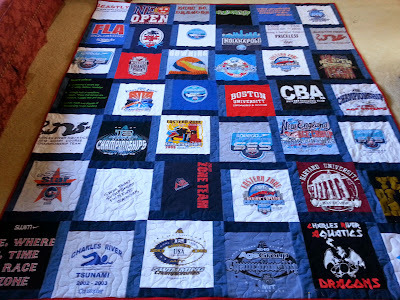 Christopher’s Memory Quilt, shown above, with 40 of his swim shirts representing his 12 year competitive swim journey! 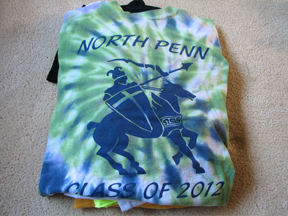 Look close and you will notice both t-shirts shown above are in the quilt, so is his favorite knit hat!